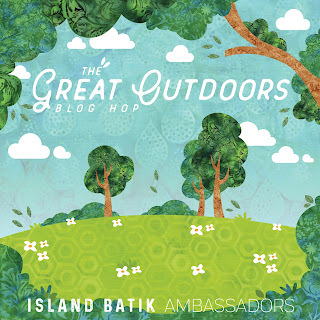 Welcome to my stop on the Island Batik Great Outdoors Blog Hop. Coming to you right now as I sit on the shore of Elbow Lake in Northern Minnesota at The Jolly Fisherman Resort. 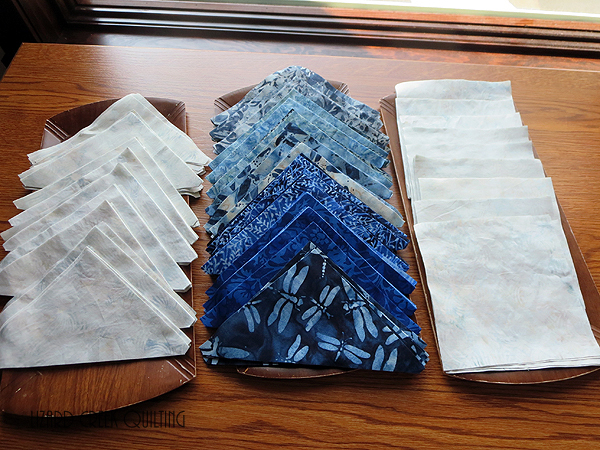 The day is drizzily and cold--seems quite fitting for the London Calling line of batik fabrics!!! They can be found here on the Island Batik website. Look for them in your local quilt shop!! 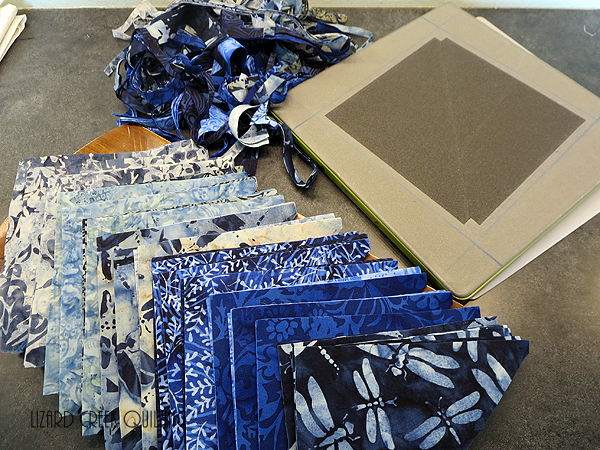 London Calling is a collection of blues--from dusty light to deep dark navy including multiple steps of blue inbetween. 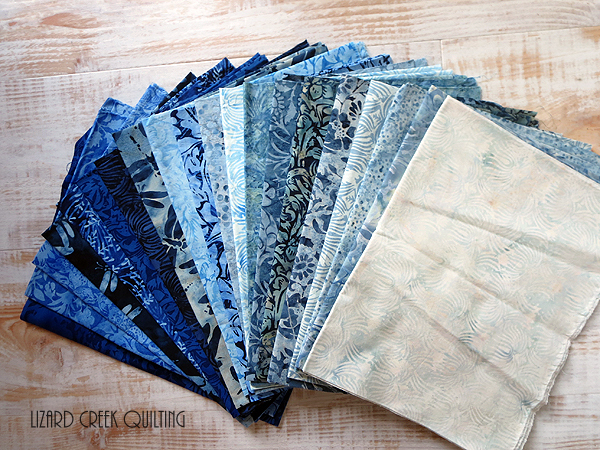 The collection of 20 half yard cuts along with 2 yards each of a light and dark were supplied to me by Island Batik as part of their Ambassador program. I have been in need of a new quilt for our little pickup camper--this was the perfect line of fabric to design a new quilt for that purpose. 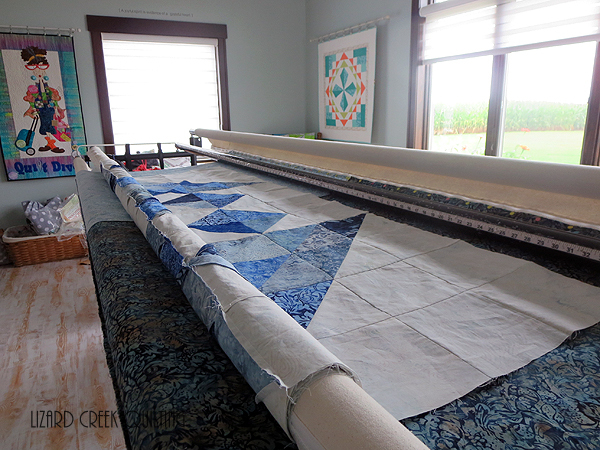 I envisioned a giant churn dash type block using all the fabrics of the collection. I just love pretty stacks of fabric all cut with the GO! 12" Mix & Match Qube. 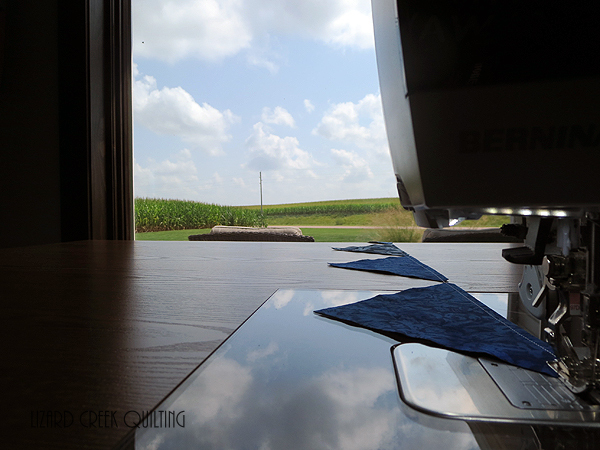 I have a written up a small tutorial sheet for cutting instructions with the Accuquilt Qube system along with a coloring page to make your own Adventure Dash quilt. 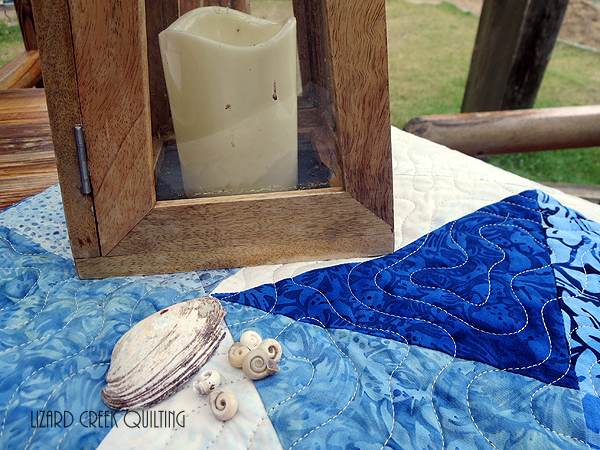 You can find that here on my Craftsy site as a free download. 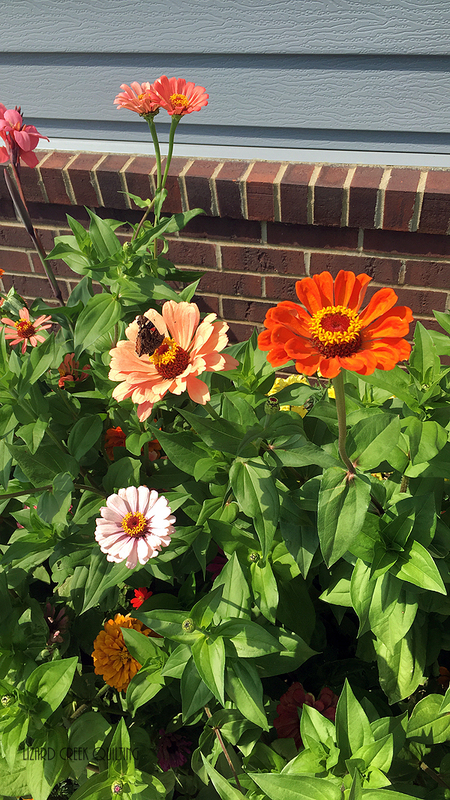 ...while the butterflys enjoyed the zinnias in front of the studio window. Adventure Dash...72" sqaure...on the dock outside the cabin!! There was a very small break in clouds yesterday to let sunshine through. Creating the perfect opportunity to catch all the great colors in the London Calling collection from Island Batik. 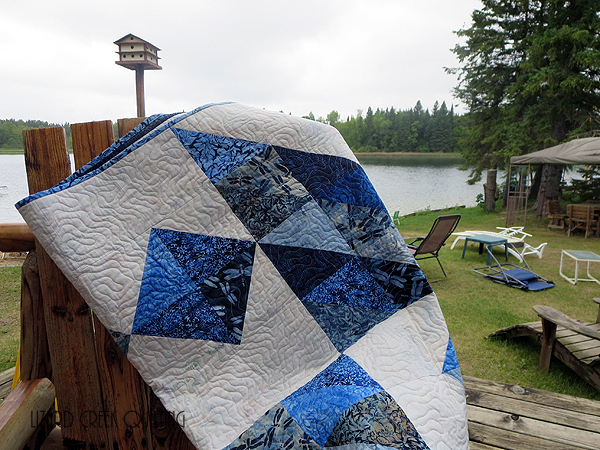 I also used the Hobbs 80/20 batting and Aurifil thread to do the quilting that were provided to me in the Ambassdor box earlier this year. 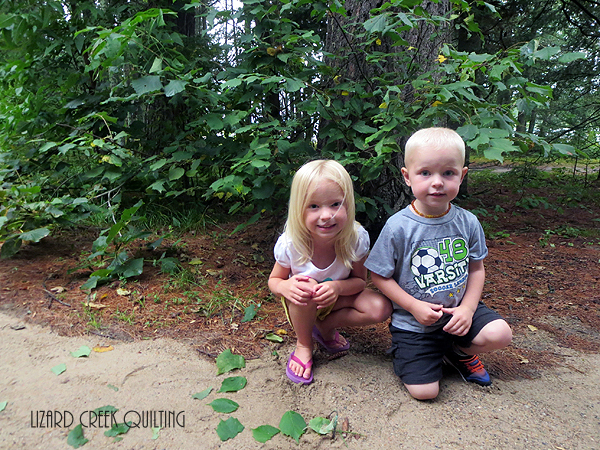 A couple of cute grandchildren creating a path of leaves for catepillars to eat--so it can make a cacoon in the house they made for it, to eventually become a butterfly. 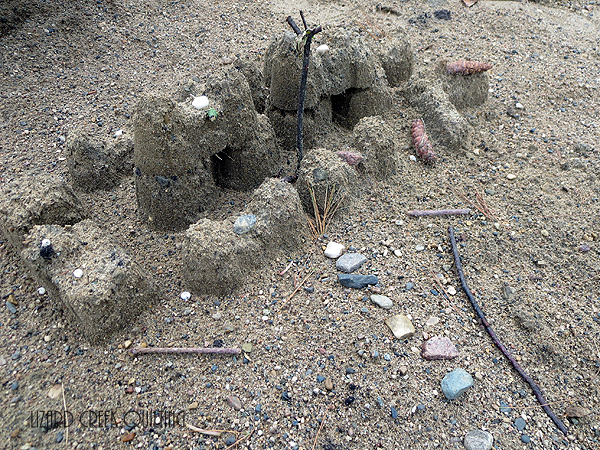 Oh the joy of creating in the Great Outdoors!!! Enjoy my view as I write this post!!! 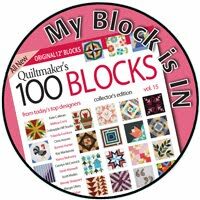 I do all of my quilting freehand on an APQS Millie. The design I used for Adventure Dash I call Wind Map. 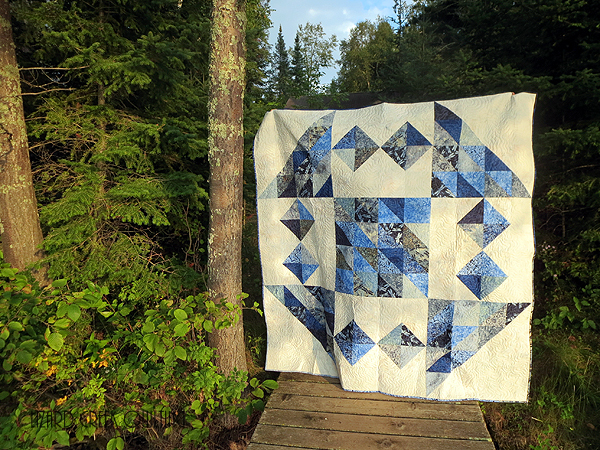 I love the great background texture it gives to an outdoors type quilt. 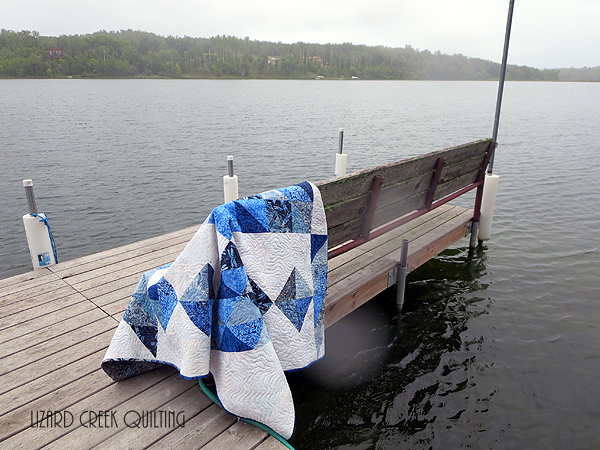 If you have ever seen a topographical map of lakes, it will look kind of like this quilting design. 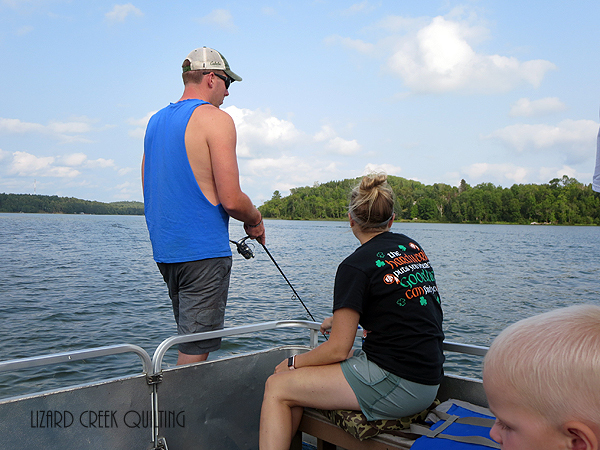 Each line representing different depths of the lakes' water so that fishermen who know what they are doing can find the fish. Benches on the end of the dock make for a great place to watch and listen to the loons. Such an erie yet beautiful sound!!! 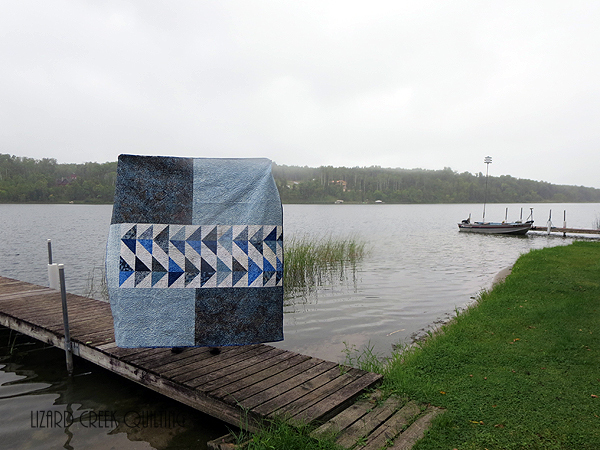 Love me a reversible quilt!! 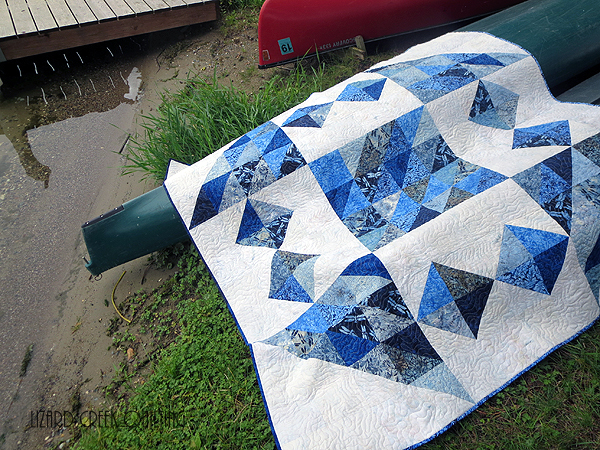 I had planned to use the flying geese rows on top and bottom of Adventure Dash--but it felt too big. 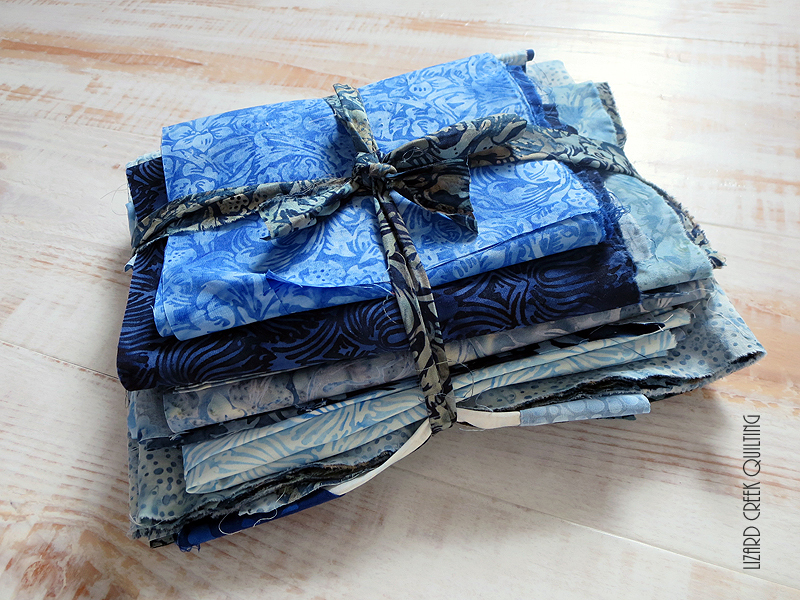 And after cutting, sewing and pressing all of the blocks--there was no way that they weren't going to be used!! So perfect on the back with the 2 yard cuts of light and dark!!! Thanks for coming along with me on The Great Outdoors Blog Hop from Island Batik. The photo above shows all the fabrics I have left of London Calling. 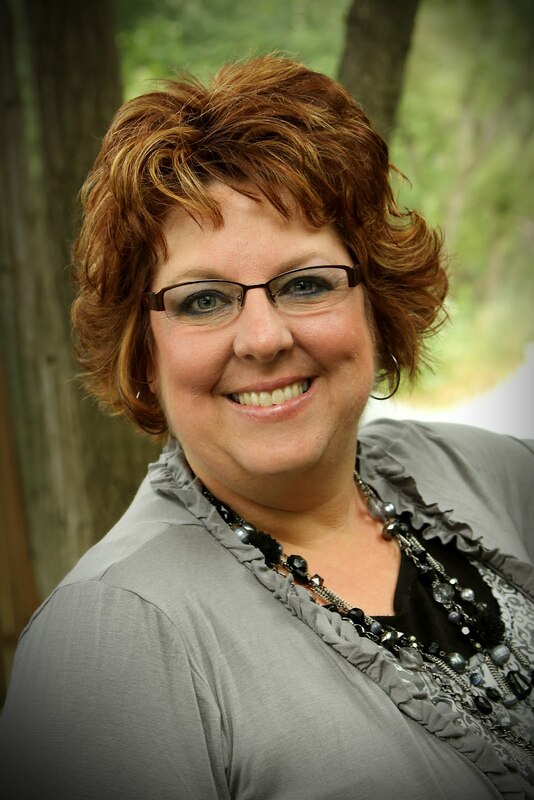 Please like my Lizard Creek Quilting Facebook page and leave me a comment there telling me your favorite place to vacation with your family and I will randomly choose a winner!! Make sure you check out all the other Ambassador posts!! There may be more giveaways on them!! You can find the list of blogs here on Island Batik's blog. Along with a great giveaway from Island Batik! !